THE Catholic Church has promised laws and concrete actions to protect children and the vulnerable after Pope Francis concluded an historic four-day Vatican summit on child sexual abuse. In a final statement delivered in the grand Sala Regia, an antechamber next to the Sistine Chapel, Pope Francis vowed to confront abusers with “the wrath of God”, end Church cover-ups and prioritise the survivors of this “brazen, aggressive and destructive evil”. Pope Francis offered a wide-ranging analysis of the plague of sexual abuse of minors globally as well as the Catholic Church. “We are facing a universal problem, tragically present almost everywhere and affecting everyone,” the Pope said. 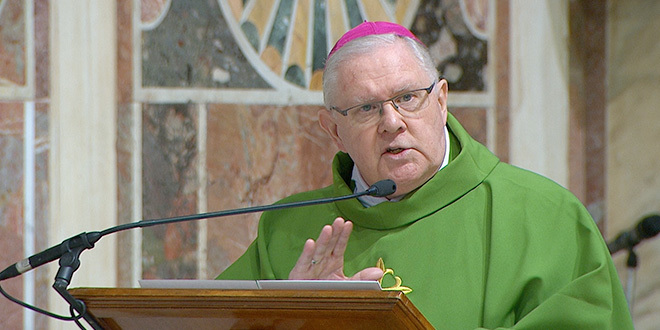 Australian Catholic Bishops Conference president Brisbane Archbishop Mark Coleridge spoke of the conversion needed within the Church, as he preached the homily in the closing Mass inside the Sala Regia, in front of more than 130 bishops. “At times we have seen victims and survivors as the enemy. We have been our own, worst enemy,” Archbishop Coleridge said. He described the Church being in need of a “Copernican revolution” where “those who have been abused do not revolve around the Church but the Church around them”. “In discovering this, we can begin to see with their eyes and to hear with their ears; and once we do that, the world and the Church begin to look quite different,” he said. After the summit, the gathering’s moderator Jesuit Father Federico Lombardi announced some first steps towards concrete actions demanded by Church leaders as well as advocates for survivors. Fr Lombardi said Pope Francis would issue a motu propio – a new set of laws and guidelines – concerning child protection for the Vatican City State. He said the Pope “has expressed the intention of creating task forces of competent persons to help episcopal conferences and dioceses that find it difficult to confront the problems and produce initiatives for the protection of minors”. And in a sign of a new episcopal accountability, bishops will also be issued handbooks clearly setting out their duties and tasks when handling abuse cases. “There will be no excuse for saying I didn’t know. It will be set out in black and white in this handbook,” Archbishop Coleridge told Australian journalists covering the four-day summit. “Anyone in the Catholic Church in any part of the world who thinks that he or she can get away with sexual abuse of the young and vulnerable has absolutely nowhere to go. However, a number of survivors and advocacy groups were disappointed the Pope and the Vatican did not go further with more direct mandates, especially in ordering bishops to implement what laws already existed. Spokesman for the Ending Clergy Abuse coalition Peter Isely told Catholic News Service he wished the Pope had told bishops to remove known abusers from public ministry immediately in order “to keep them from harming children”. “That’s pretty simple,” Mr Isely said. Archbishop Coleridge described his homily as “a meditation on power and the way in which power can both destroy and create … and in the case of sexual abuse it has been incredibly destructive”. He said Pope Francis’ closing speech was “big picture – spiritually, globally and historically” and that it was clear the Church cannot tackle the enormity of child abuse on its own. It had to work with all organisations concerned with the welfare of children and the vulnerable, he said. In his closing talk, Pope Francis provided data demonstrating that the sexual abuse of minors was prevalent first of all in families. He said, the statistics “do not represent the real extent of the phenomenon … because many cases of the sexual abuse of minors go unreported, particularly the great number committed within families”. “Today we find ourselves before a manifestation of brazen, aggressive and destructive evil,” he said. He noted the “anguish tragically leads to bitterness, even suicide, or at times to seek revenge by doing the same thing”. “The one thing certain is that millions of children in the world are victims of exploitation and of sexual abuse,” he said. Considering the worldwide nature of the problem, Pope Francis said, “we need to be clear that while gravely affecting our societies as a whole, this evil is in no way less monstrous when it takes place within the Church”. “The brutality of this worldwide phenomenon becomes all the more grave and scandalous in the Church, for it is utterly incompatible with her moral authority and ethical credibility,” he said. He emphasised the fact that “consecrated persons, chosen by God to guide souls to salvation, let themselves be dominated by their human frailty or sickness and thus become tools of Satan”.